On December 26, 1896, the military court tried Jose Rizal and later found him guilty of rebellion, sedition, and conspiracy. 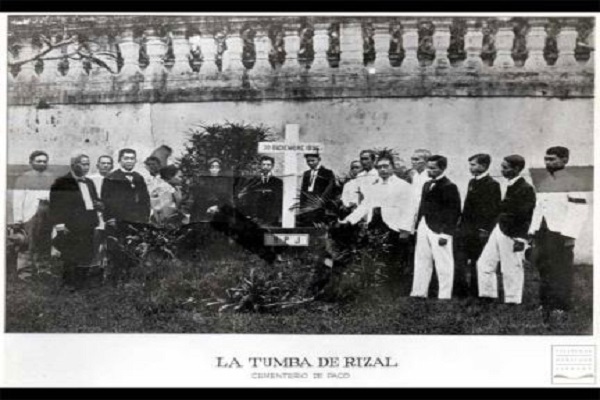 The Spanish authorities believed that Rizal’s writings “fatally and necessarily” incited the rebellion which, by 1896, had already become a revolution. On December 29 at 6 a.m., Capt. Rafael Dominguez read before Rizal his death sentence. His execution was scheduled the following day. At around 7 a.m. of December 29, Rizal was transferred to his death cell in Fort Santiago. There he received numerous visitors, including his counsel; some Spanish officials; and several priests, his former professors, with whom he supposedly discussed reason and religion. The Archbishop of Manila, Rev. Bernardino Nozaleda, recalled: “During that day, although Rizal did not reject [the Jesuits], he persisted in his errors contrary to the Catholic faith.… However, at the last hour, Rizal abjured, in writing, his religious errors.” In other words, Rizal, a Mason, was said to have recanted his statements against the Church and to have returned to the Catholic faith. The controversy over Rizal’s retraction has not been settled. The “original” document of Rizal’s “retraction” was found in the archdiocesan archives in 1935, 39 years after having disappeared the day Rizal was shot. There was no record of anybody seeing this “original” document in 1896, except the publishers of La Voz Española, which published its contents on the day of Rizal’s execution: “We have seen and read his (Rizal’s) own handwritten retraction which he sent to our dear and venerable Archbishop….” Most experts think that the handwriting on the document is authentic. However, scholars are baffled as to why Rizal, who courageously faced persecution for most of his life, and who was finally sentenced to death for his beliefs, would suddenly balk at the last, futile moment. (For more discussion on Rizal’s retraction, see Garcia, 1964; Guerrero, 1998; and Vaño, 1985). At 7 a.m. on December 30, 1896 at Luneta, Manila, the 35-year-old patriot was shot in the back by a firing squad. He hesitated, turned halfway around to face his executioners, and fell on his back to face the Philippine sun. Garcia, Ricardo P. The Great Debate: The Rizal Retraction. Quezon City: R.P. Garcia Publishing Co., 1964. Guerrero, Leon Ma. The First Filipino. Manila: Guerrero Publishing, 1998. Vaño, Manolo O. Light in Rizal’s Death Cell: The true story of Rizal’s last 24 hours on earth based on eyewitnesses’ testimonies and newspaper reports. Quezon City: New Day Publishing, 1985.